This newer Wallowa Lake cabin has pine throughout and a private porch and lawn. It is designed for wheelchair access. You can sit on the back deck and watch the bumper boats or relax on the quiet evenings. You can rent adjacent #7 Grand Fir to sleep up to 12 people! This cabin is in a great location that is very close to the lake and all the other activities including mini golf, restaurants, the Wallowa Lake Lodge, Wallowa Lake Tram, and much more! Take a hike at the trailhead in the mornings and have a BBQ in the evenings! 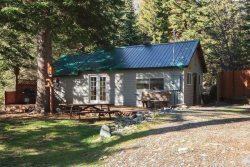 This is a great cabin for a small family or two couples, not to mention it is a pet friendly cabin so you can bring your "best friend" on all your fun adventures in the Eagle Cap wilderness! Book this cabin today and explore one of the Seven Wonders of Oregon with your loved ones!